Another band out of the UK on the scene that draws plenty of their influence from Hawkwind. 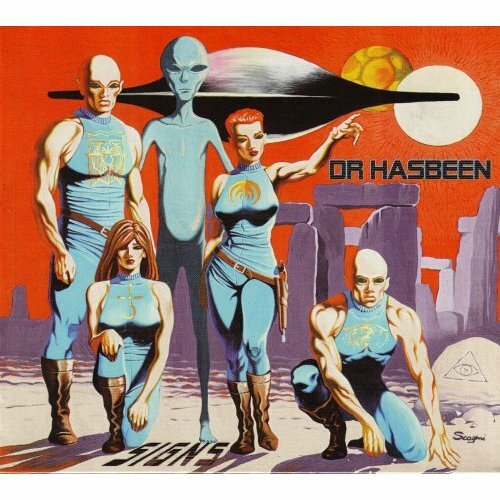 As it turns out, Dr. Hasbeen does have several CD releases available. I, for one got plenty out of this Italian import title. Total of twenty-three top quality tracks of well-played space rock - just the way so many of us old school fans like it. Disc one is made up of various studio cuts, liked the total galactic opener title track "Signs", "The Seers Song", "Why Syb" (sounds a lot like a Harvey Bainbridge composition), the atmospheric "Looking Glass - End Of Days" and the adventurous "Lifers". Disc two is an hour long compilation of live songs performed between 2000 - 2003. I may actually like the second CD a bit better - as I was impressed with the fantastic "Countdown, The Final Flight", the wailing "World Of Dreams", "Apollo 13" as well as their Hawkwind covers - "Psi Power", "Golden Void", "Silver Machine", "Sonic Attack" and "Master Of The Universe" with "Welcome To The Future" tagged on at the end. Current line-up: Martyn Has Been - guitar, synthesizer, keyboards & vocals, Daz Fletcher - lead guitar, Phat Jason - bass & vocals and Stuart Dilkes - drums. Comes housed in a three fold-out digipack with booklet. Be sure to visit their My Space page. Highly recommended for fans of Liquid Sound Company, Architectural Metaphor, Farflung, Spacehead and Mr. Quimby's Beard.